On a summer night in 2003, riding on a New York subway train, Doug Bruce somehow lost his memory. Director Rupert Murray, an old friend of Bruce’s, made Unknown White Male to document Bruce’s experience. In his backpack, he found a telephone number that eventually led him to Nadine, an ex-girlfriend. She was able to lead him to his loft in the East Village where he was able to establish some facts about the life he had forgotten. The only genuinely moving moment of the film is a later interview with Bruce in which he tearfully recalls establishing the contact with Nadine and the enormous relief of coming out of the isolation he was experiencing and reconnecting with his prior life. In that life, Bruce, an Englishman, had been sufficiently successful as a stockbroker that he could retire at age thirty from the prosaic halls of finance and pursue a career as a freelance photographer. Bruce proceeds to try to reconstruct his life, reconnecting with friends and family. His intriguing situation, in effect, allowed him to reinvent himself, examining all the evidence that was forthcoming from his past, picking and choosing for the future. He is able to see the world freshly ("like a newborn baby"), but through the eyes of an adult. Some things, though, are permanently lost and missed: memories of childhood, memories of his deceased mother. His father finds that he is now more reflective than he was before, when he was apparently outgoing and secure. His sister thinks he has become more relaxed, shows more emotion, but has perhaps lost some of the spark he had before. 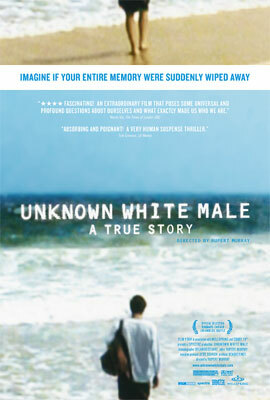 Unknown White Male is a mildly interesting documentary about an intriguing human situation. Bruce–young, attractive, affluent, and reasonably articulate–somehow remains elusive, partly no doubt, due to the very reason he’s on film in the first place, his loss of identity. That makes it difficult to identify with him and his situation. His own observations (and those of Murray) tend to remain at a rather mundane level; they don’t get past the obvious, to possibly more profound reflections on Bruce’s situation. Further, the resulting changes in his life and behaviors, at least as revealed by the film, seem to be relatively minor. The rare opportunity to reinvent himself doesn’t appear to have elicited much in the way of change or creativity.